It's been an exciting journey for the AMLT team and entire community that has supported this project since the successful token sale. The first roadmap consisted of exciting activities, sneak peaks, alerts, Q&As. We have seen the successful launch of AMLT beta panel and site, on-boarding of first community and commercial Network Members. At the end of the day we all made history and created the first system of its kind in the history of finance. All this action packed adventure has led us to the exciting stage of "Reward Distribution". Yes you read it right! Last week we published the first set of stats where over 275 unique cryptocurrency addresses were reported to the AMLT Token Network in the 1st month! 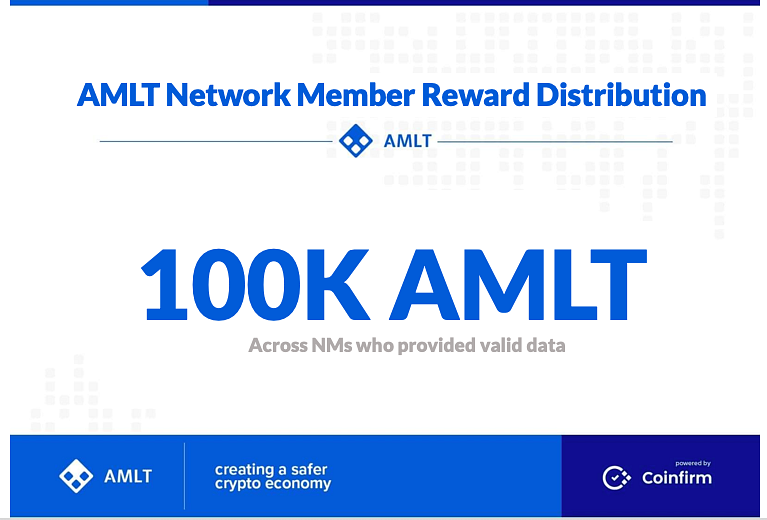 We are proud and happy to announce that the 100K AMLT tokens reward were distributed to Network Members after validation of data provided through AMLT Network Member Panel. We also wanted to let you know that we updated some aspects of the AMLT Membership Terms. According to our terms as an AMLT Network Member it is your responsibility to regularly check the Company’s Website for any such notices and updated Terms. You may not agree to the amended Terms. If you do not agree you may terminate your membership by giving us an appropriate notice by email or in writing in accordance with provisions of Clause 2 section XVI of the Terms. If you are a Consumer and you do not agree to any amendment you may withdraw from the Programme with immediate effect during 14 days from the effective date of amendment. "In order to reach the Minimum Amount you can buy AMLT from us or by using the exchange platform upon your choice. The AMLT can be bought from us just once and only before you become a Network Member in accordance to section V of these Terms. You may attempt to buy AMLT from us after you have been positively verified during KYC otherwise the AMLT will not be sold to you." CHANGE 2: Added new Clause 6 to Section VII. "The reward shall be paid for the addresses not known previously to Company and its affiliates (including Coinfirm)." "The AMLT Network Member reward will be paid in AMLT within 7 working days from the end of the submission period"
During Beta Period the pool of AMLT for rewards is 100.000,00 (one hundred thousand) per month.